Forget FIFA. One sports series has been leagues ahead of its competition for well over a decade and it’s finally getting the PC version it deserves. 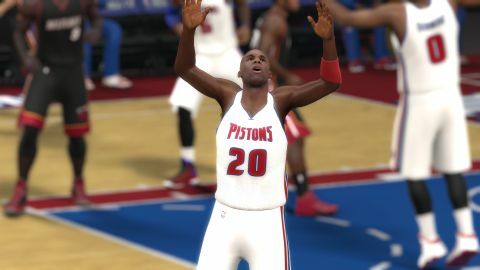 Like The Mailman Karl Malone, Visual Concepts’ startlingly beautiful NBA2K15 delivers another backboard-shattering slam-dunk, offering the kind of presentation, fluidity and authenticity that have been ever present for over a decade. This is the second iteration of the series’ ‘next-gen’ incarnation, after a gorgeous start last year on the new consoles. Play an exhibition game from the standard TV camera position, and you can do that thing where you call people into the room and say ‘look at this’. It’s no overestimation to say that, at a glance, NBA 2K15 looks real. With visuals cranked up to High (you’ll need a fair bit of grunt in your rig for this, so be warned) it’s a genuinely stunning looking videogame—picture perfect character models, world-class stadium lighting and best-in class animation. It’s no overestimation to say that, at a glance, NBA 2K15 looks real. The actual mechanics of basketball have been marvellous in this series for years, so the raw physical updates in the game engine are slight but still significant. You’ll notice new collision animations as players clatter into one another in the paint, a greater variety in bounce passes into the post (where the big lad stands near the basket, in other words), and improved smoothness when collecting the ball on the run. There are still instances where moving the ball around the perimeter can look a little awkward, but this is an engine making thousands of physics and AI calculations every second—you can forgive it the odd little uncanny valley stutter when everything else looks so splendid. Be warned, though. NBA 2K15 has innate appeal because it looks so incredible, but this is very much a basketball people for those who know their crossovers from their pick and rolls. Try to play it like NBA Jam and you’re going to feel like the White Men Who Really Can’t Jump. Defending in basketball is less about ‘tackling’, football style, and more about defending and denying space to force the opposition into making a bad pass or a low-percentage shot. The game encourages you to mark your man by placing arrows on the player selection reticule that shrink as you get into position, and a new meter shows where specific players are most prolific on the court, but without a basic understanding of the sport, you will struggle. Know that going in. If you’re a devotee of the NBA though, or even a lapsed fan who remembers the Space Jam hoops heyday of the 90s, there is so much to love here. The volume of content is almost overwhelming. A vital place to start, though, is the Mass Effect meets Cribs daftness of My Career. Here, you take your own created player from rags (middle class rags – he has a flatscreen and a nice apartment) to abundant riches as you rise up the ranks of the NBA. The action is shot from behind, and you only ever control yourself. You have to play and know your role within the team (if you want a lot of the ball, pick Point Guard), you’re scored on your performance, and rewarded in currency you can then spend on your attributes. The mode itself isn’t revolutionary, but the amusing dialogue choices you get to make influence your relationship with the fans and you teammates, which directly feeds into how your team reacts to you on the court. By isolating the action to a single player, My Career allows you to gain a much stronger understanding of how each position works, and how important an individual is in a basketball match. The sport is 5 v 5, meaning each component part vital, but also less demanding when it comes to AI. Admittedly, that still doesn’t excuse the times when teammates stand frozen with the ball, running the shot clock down, seemingly crippled by choice, but more often than not your cohorts will make sensible, realistic movements and decisions on the hardwood. My Career is joined by MyTeam, the Ultimate Team-a-like that maybe lacks that mode’s gambling-lite compulsion but does a solid job in mimicking it, standard online modes that play a solid if unspectacular game, and the new NBA2KTV, where a real person hosts a TV show about the game and the sport itself, as if they’re one and the same. And do you know what, they kind of are. NBA 2K15 is completely intertwined with the real sport. The presentation is so good there are even promo vignettes before matches, and they’re different every time. There are half-time interviews with a sideline reporter. A studio with punditry. The commentary is outstanding. Allow yourself to get pulled into the show, and it’s hard to see where real life finishes and NBA 2K starts. It's the best sports series on earth. By a distance.